Valve boss Gabe Newell has confirmed that the company has appealed the decision to deny Left 4 Dead 2 classification in Australia - if it doesn't work, though, there's an Aussie-friendly edited version ready to go. As we predicted last week, Gabe Newell isn't just using his trip Down Under to play some dude's Left 4 Dead mod and catch some rays on the world-renowned Australian beaches - he's there on business, too. Speaking at a press conference in Sydney, the Valve president confirmed that the company had appealed the Aussie Review Board's decision to reject Left 4 Dead 2 Down Under, reports Kotaku Australia. "I thought Left 4 Dead 2 would get the same treatment as Left 4 Dead 1," said Newell. "So I was a little surprised [by the Review Board's decision]." It certainly isn't out of the question for the Review Board to change their minds, after all - F.E.A.R. 2 was successfully appealed last December. However, Newell also confirmed that Valve had prepared an edited version of L4D2, which is "fully compliant with the guidelines" for an MA15+ rating, and submitted it to the Review Board as a backup plan. "We think Left 4 Dead 2 is a lot of fun," explained Newell. "It's a game for adults. But we're aware that different countries have different restrictions, and we want to make the choices that make the game the most fun for that country." I'm not sure an edited L4D2 is going to be the "most fun" version, but I suppose that getting to play the game at all is more fun than not playing it. 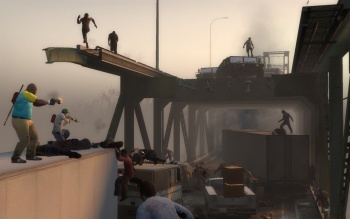 The Review Board is expected to make a decision on the edited L4D2 by the end of the day, but Newell was adamant that this was only a "Plan B" meant to ensure that the game would stick to its planned November 17th release date worldwide - the Review Board won't release a verdict on the unedited L4D2 until October 22nd. If the edited version ends up released but the appeals proves successful, the game will be updated to reflect the shiny new gore ... at least on the PC: Xbox 360 owners know that Valve is slightly less apt at updating their console games. So one way or another, Aussies, you'll get to play L4D2 Down Under after all. Your zombies might bleed strawberry jam and your guns might shoot rainbow pellets, but you'll be playing the game anyway. That's good enough, right?